What separates singing from beautiful singing? It starts with in-tune, in-time singing, but it is much more than strict adherence to what is written. The singer must have regard for the song, their audience and their fellow singers, and seek to evoke emotion in the listener. Students come into our classrooms tired, over-excited, upset, restless, distracted, emotional and smelly! It is very easy to "switch off" and join in the singing without actually making music. However, we are training ears and we want them to be delighted! When you find your students going through the motions of singing and not producing fine music you might find these practical suggestions helpful to get them back on track. A stooped posture makes it harder to sing and the first casualty is the beauty in our serenade. While your class is singing, use your body language to remind them to stand up straight and provide air support. The octave leap in Song of the Skylark (free for a limited time) will engage their diaphragm. Also, try Sing Sweet Music (set to the melody of Greensleeves). If you have an advanced group try Evening Prayer. It is available in three keys, so you can choose the best key for your group to handle the wide range. What is singing without listening? Each student needs to self-regulate their volume so they can be heard and also hear the singers next to them. Careful listening to each other is important for harmony, but even more so for unison! Start with the three-part canon Dona Nobis Pacem (free for a limited time). Students can listen for which parts are moving (where the melody is) and which parts are holding long notes (harmonic foundation). Then try The Ash Grove. The wide intervals require careful listening to maintain consistency of tone across the singers. A song in unison, sung beautifully, can minister to the soul just as much as a song with beautiful harmony! Dynamics are a powerful way to convey emotion to your audience. There’s loud, soft, everything in between, and then there’s nuance. Use dynamics to connect your audience to the emotion of the words and musical phrases in Hard Times Come Again No More (free for a limited time). Try the same technique in Keep Your Lamps, particularly in the chorus. Sakura is a simple melody. Examine the effect of different dynamics and hear the song come alive. Too often our students fall into the "one speed fits all" trap, but the right tempo will reflect the meaning of the song. Encourage your students to relish the long notes in The Water is Wide (free for a limited time) and hold them for their full value to evoke a tenderness in their singing. Is there opportunity in the song for a pause, or a ‘ritardando’ or an ‘accelerando’ to help express the inherent meaning of a song? Let your students take turns experimenting in this way with Oh Watch the Stars or Londonderry Air. Written tempo and dynamic markings are helpful to understand how to make a song beautiful, but we also need to read between the lines - i.e. is the way we are singing consistent with the lyrics? Ah Poor Bird (free) is a somber piece. Our natural tendency is to insert a breath after the minim, but if we sing it in two bar phrases it has a dramatically different feel that better matches the lyrics. Similarly, Tree Song is a sweet, inspirational song whose beauty really shines when sung in four-bar phrases. Good air support is required over the wide intervals to achieve a legato style. Encourage your students to persevere - the result will be magical. Remember, "Often a single experience will open the young soul to music for a whole lifetime" - Zoltan Kodaly. 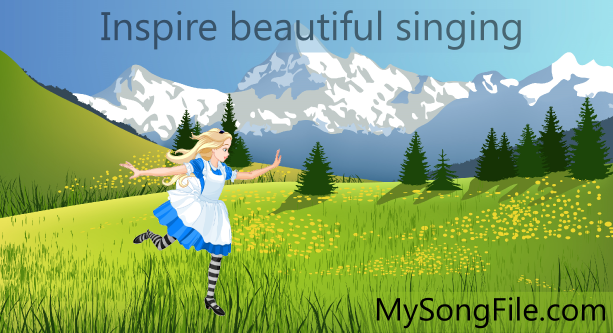 Have a look at our new resources page for more beautiful songs and teaching tips. A beautiful song by Felix Mendelssohn. This beautiful 3 part canon is fantastic for teaching the rhythmic element 'tum-ti'. A beautiful folk song with long, legato phrases. Can be sung with the canons "Rose Rose" and "Hey Ho Nobody Home".